Cesarean section deliveries are on the rise. This type of delivery is when they deliver your baby via an incision in the abdomen. Because this is a surgery, there is a risk of a C Section infection. This can happen at the place you have your incision made or in the abdomen. It can happen immediately after delivery or during your recovery period. While these infections are rare with proper wound care, they are possible. The hospital will let you know what to watch for, but read further for more information to help you understand. How Do You Know If You Have C Section Infection? A C Section infection is often caused when bacteria enters the surgical site where your baby was delivered. It happens to about 3 to 6 percent of C section patients. C section incision infections tend to occur more often in women that are high-risk such as those who have diabetes, auto-immune disease, pregnancy complications (high blood pressure), and women who live in developing countries. After a C section, you will need to watch your incision carefully and perform any care orders given to you by your doctor. If you are having trouble seeing your incision, you should have someone close to you take a look at it daily. You need to contact your physician or go to the hospital if you have symptoms of an infection. It is important to know that there is a possibility for developing sepsis (septicemia) following a c section. This is an infection that invades the entire bloodstream. The signs of sepsis are chills, increased heart rate, fast breathing and very high fever that comes on suddenly. If left untreated, septic shock can set in and is very serious. Septic shock causes very low blood pressure, confusion, and the blood does not clot. This is a medical emergency and needs to be evaluated in the nearest emergency room. What Puts You at Higher Risks for C Section Infection? **Note: If you suffer from borderline obesity (BMI 25 to 30) your risk of c section infection is 1.6 times higher than normal. If you are in the obese category (BMI 30 to 35) your risk is 2.4 times higher than normal. If you have morbid obesity (BMI over 35) your risk is 3.7 times higher than normal. If you develop symptoms in the hospital, let your nurse know so they can take appropriate action before you go home. Most of these infections don’t come up until after people go home. You can show symptoms anytime within the first few weeks of recovery. This is why follow-up care with your doctor is very important. 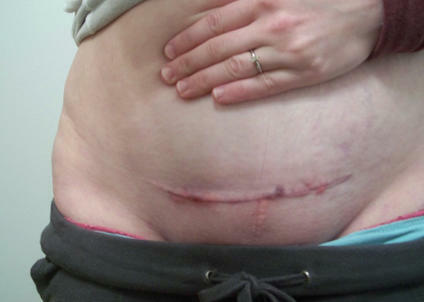 An infection in the C section incision is diagnosed by a doctor. They will take a look at how the incision is healing, look for signs of infection and ask you how you have been feeling. They may also ask what you might have been exposed to and about your wound care at home. If you are having drainage or redness in the area, the doctor will open the incision up a little and use a swab to take a sample of the drainage. They may also need to insert a needle to take out some fluids. It is then sent off to the lab for a culture to see if bacteria are in the wound. If your infection is bacterial, you will be put on antibiotics. Most antibiotics treat either Streptococcal or Staphylococcal forms of bacteria, the most common causes. If the infection is found before you leave the hospital, they will most likely start you on IV antibiotics. If they discover the infection after you have gone home, they may treat you with oral antibiotics. The doctor will carefully check the wound to make sure the incision did not go through the abdominal fascia over the muscles. If this happens, the bowels can leak into the surgical site. Wound care and packing may go on for a week or two. The doctor will re-check to make sure the incision is healing well. You may need a few stitches to close up where the packing was. If the wound is filling in nicely, the doctor may choose to keep it open. Allow your body to rest. Sleep when your baby is sleeping. Avoid lifting and heavy housework. Keep things you need next to you to avoid unnecessary movements. Give your tummy support. Stand up straight when walking. If you cough, laugh or sneeze, hold a pillow or your hand to your abdomen and use slight pressure. Increase your fluid intake. Your body needs extra fluids for healing and breastfeeding. Giving your body the fluids it needs can help healing and keep you from getting constipated. Use over-the-counter medications. With your doctor’s okay, you may need to take over-the-counter anti-inflammatories for pain and inflammation.